Silo Cinema is a new addition to the very popular outdoor cinema. The wheat silo provides the unique cinema screen in grain producing rural areas. The silo provides the possibility for a very large screen surface but with certain challenges. Wheat silos are typically circular and joined together side by side. Because the resultant screen surface is not flat, providing a sharp image is the major issue. Video warping solves this problem. The very latest high technology Christie digital projectors provide for minute geometric adjustment in all parts of the lens so that the projected image is sharp and in focus on all parts of the curved surface. Another feature is colour blending which allows the image to be adjusted for the colour of the silo screen surface. This is very helpful as ageing silos mostly light tan in colour. For a great cinema screen experience, the projection can be screened over two or more silo surface proving an image width of about 20 metres! The sound and media equipment remain the same for all outdoor cinema events. Thinking of hosting a pop-up cinema event in an unconventional place? Anything is possible! There isn’t a better way to celebrate Australia Day than with a great Australian flick set in the heart of New South Wales. Together with the lovely Community Development Team at Bland Shire Council, Smart Digital Australia were proud to bring movie magic in the form of an 18-metre screen across the remarkable Mirrool wheat silos. Of course, no event can go off entirely without a hitch. In true Australian summer fashion, the temperature reached 47 degrees, along with lightning and a major dust storm, causing power outages that threatened the screening before it had even begun. Luckily, the stars aligned and chaotic weather subsided. The pop-up silo cinema was up and running at nightfall, for a picture-perfect movie night, shared by an audience of over 250 guests. 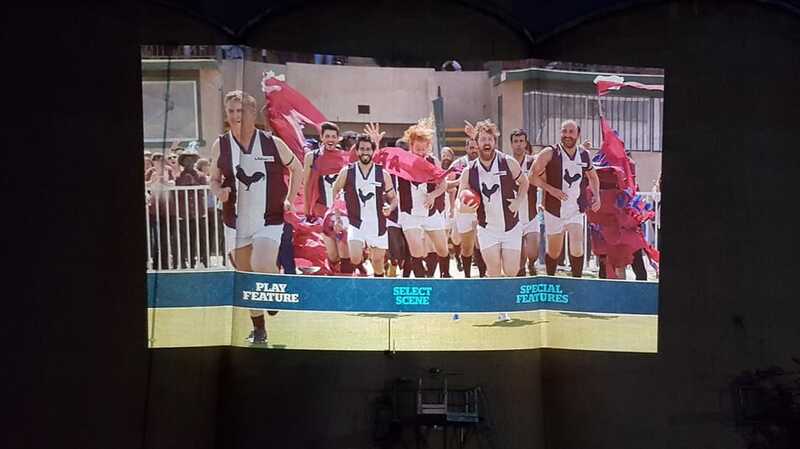 The aptly chosen Aussie film, The Merger (2018), was a hit that provided much loved comedic value with a story about a local AFL team. All in all, the movie night was a great success shared by the community, and a truly unforgettable Australia Day.